SouthpawHD had the most liked content! Think I totaled my ‘15 - what to replace it with? Looks like we lost another one. Seems to be a common theme. While GM sales are still good, Ford is outselling GM and Ram is gaining ground really, really quick. And I will admit, if I could do it all over again, Ford would be at the top of my list this time. Good luck to the OP, the Raptor is one cool truck. Nitto Ridge Grapplers seem to get good reviews too. Nittos will likely be my choice for tires next fall. That is pretty cool. Probably only be on the Denali and price tag will be near $100k. Zoinks! I was about to post the same thing. Couldn't agree more. The 6.0L gets horrible gas mileage on short trips, so as your daily driver driving short trips, it is something to think about. I am in the camp of buying what you will want and enjoy the majority of the time, so the 6.2L might fit that bill for you. One more thing, the 6.2L recommends premium fuel, so your cost per mile might to close to the 6.0L. I am very impressed with the HIDs on my '18 Sierra. The high beams aren't great, but the low beams with the LED fogs on are really nice and light the road very well. I've since been in some high end vehicles with LEDs and HIDs and I believe mine are just as good if not better than those high end vehicles. Do you know why you don't have "sucked in by semis"? 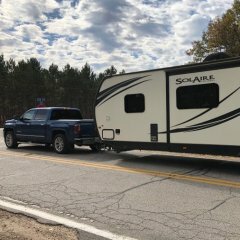 Because you're trailer and truck are properly packed (weight distributed properly) and you're weight distribution hitch is set up to match your truck height and trailer size and includes some measure of anti-sway. That is ever so important when pulling a larger trailer on a 1/2 ton. Well done. But 70 is just a little too fast, likely your trailer tires are limited to 65MPH. Something to look at anyway. Can it be done? Yep. Will it be comfortable and easy at highway speeds and wind? Nope. In this picture I towed it 55 miles, but the trailer was empty and the truck was virtually empty too. There is no way I would want to tow it fully loaded with gear. 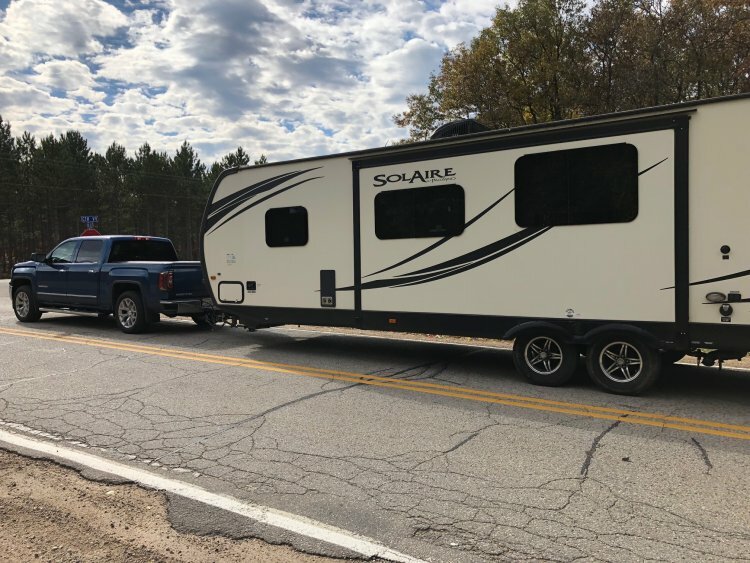 Now that being said, and as another poster said, if you're towing only once and a while (I tow that trailer only twice all year to and from my lake lot) and it's relatively local, it would probably be fine. But pack light and have a really good weight-distribution hitch and go slow. So far so good. Been through a few rain storms and a snow storm and a little bit of cold. Anyone here have an LTZ (or HC) with a jump seat? I have a Sierra SLT with 40/20/40 and had to work hard to find it as I need it for extra seating capacity. No cons other than the price. I find that the red of the brake light is almost perfect of the led brake lights on the truck (the red of just the taillights is off just a touch) and the white reverse lights helps illuminate the camera at night. I really like it. If not a Duramax, then WAY overpriced. I got the Putco version. Love mine.